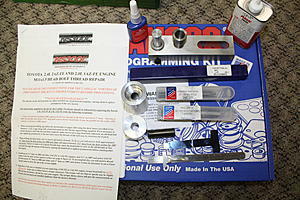 I have a Northstar NS300L tool kit that I rebuilt our 2008 TC1 / 2006 2AZ-FE block threads with. It has only been used once and is in like new shape. Over 1/2 of the tap magic is left and the red thread lock is pretty much gone but sending the bottle with it all anyway. There is one insert left in the kit, they give a spare in case one has a problem. The thread inserts cost $98 shipped for 11pcs or $175 for 21pcs depending how many blocks you will be building. This is the permanent fix for all of the older 2AZ-FE engine blocks with the thread issue. It's a great way to make some money if you want to grab 06' down blocks at the U-pull and bullet proof them. If you want to see pictures of the threaded / inserted block check my "Macy" build. $175 shipped - Need to clean out the garage for a new project! tc 2az-fe turbo kits interchangeable with solara 2az-fe?